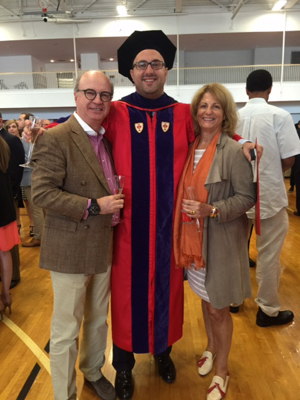 Anthony George Kelamis, son of Panos and Rea Kelamis of Dhahran, graduated on May 17 from the Boston University School of Law with a Juris Doctorate (JD). He also received the Faculty Award for Academic Accomplishment. Anthony was born in Dhahran in 1986. He graduated from the Dhahran Junior High in 2002 and he then attended Trinity College School in Canada. He received his undergraduate degree from McGill University in Montreal; afterward, he then studied law at the University of London in the United Kingdom. The Kelamis' family has been with Saudi Aramco for more than 30 years.